Extreme behaviors often inspire extreme reaction. When three masked gunmen opened fire at the Paris office of Charlie Hebdo on Wednesday, an immediate and predictable brickwork of free-speech chest-pounding unraveled, even as security forces were being dispatched and the suspects remained at large. Cartoonists took to their drafting tables and journalists mobilized, both to report the story and to express their own horror at what had occurred. 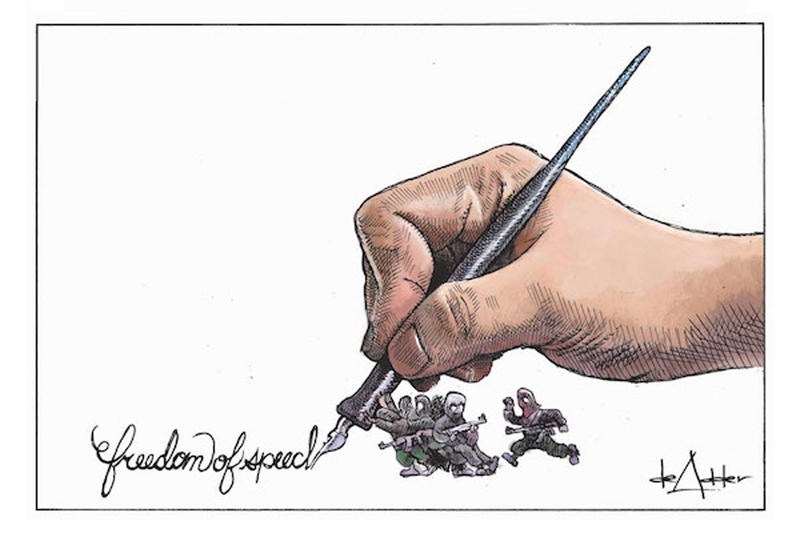 Social media was flooded with proclamations of the importance of the freedom of expression. Something I hadn’t predicted occurred shortly after the news broke, as well. Another contingent of Facebookers and bloggers surfaced, apparently mystified by the strong social response to this event. The number of victims seemed small to them and, to others, the plight of foreign journalists seemed irrelevant. Uglier sentiments about the evils of Islam and the worthlessness of French lives also made their way onto the social network and even into certain sectors of the news. There were also those decidedly callous remarks, blaming the provocateurs at Charlie Hebdo for their own fate. Words should not be met with gunfire, nor should any reasonable individual tacitly accept such an action. The attack on Charlie Hebdo was not just an assault on those who were killed and wounded, but an assault on speech itself; content creators, artists, academics, and journalists across the globe recognized this instantly and responded. In a free society, the law provides that individuals may say and write what they please. The proper approach to materials that offend is not to read them. Critics are endowed with the right to use words of their own to speak out – not violence. I conceive that it is much more obscene to violently attack an individual for having ideas and making lines on paper than to actually have ideas and make lines on paper. A Danish newspaper – the very publication, in fact, that inspired riots across Europe ten years ago after publishing a cartoon depicting the prophet Muhammed – expressed today that it would not be re-publishing any inflammatory cartoons in the wake of these attacks. In a sad fit of lassitude, the newspaper itself admitted that violence is an effective tactic to quiet the media. It is important to note that this statement is true only within the context of this one publication. Almost every other major newspaper in Denmark has re-published the offending material. The attack on Charlie Hebdo has seen a massive proliferation of new cartoons condemning terrorism, as well as massive re-distribution of the very cartoons from Charlie Hebdo that inspired Wednesday’s attack. In committing their crimes, Hamyd Mourad and brothers Saïd & Chérif Kouachi managed to enhance the dissemination of the very material we can only assume they had hoped to annihilate. There is little question that freedom of speech is paramount to the preservation of the Republic. We will never see an end to the debate over free speech because the protection of it often involves the defense of seemingly indefensible material. To uphold the rights of an individual to read, to write, or to say what one disagrees with will continue to be a great challenge, and we will continue to rise to it.